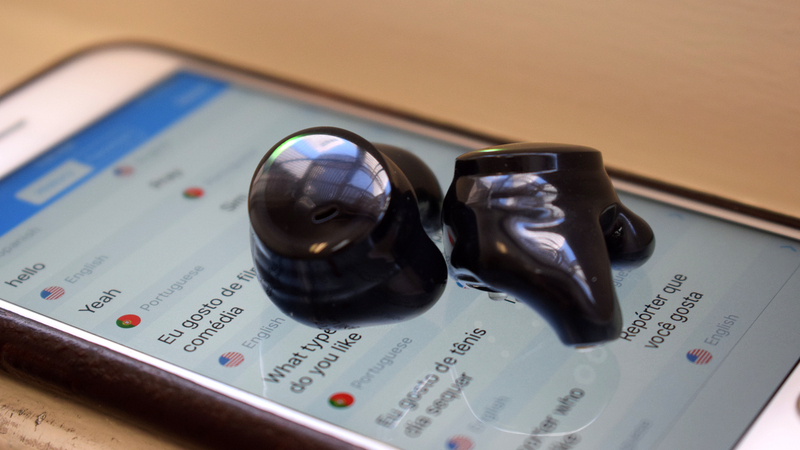 Can Bragi break down language barriers? Of the many benefits that hearables and AR will bring, breaking down language barriers is one of the most exciting. Pilot promises to do it this year, while Doppler recently showed me a working real-time translation demo on its Here Ones, and tells me it plans to have a version of it later this year. Bragi is first to the door, sort of. Its new Dash Pro offers real-time translation, as does the original Bragi Dash, but it relies on the third-party app iTranslate. Bragi provides an interface so you can translate from the earbud and through the phone - and vice versa - while iTranslate does the brainwork. It's a wonderful feeling, that sense of positive rapport when you can speak to someone in their mother tongue, but what if one day we could just do it while speaking our own language? How close to the dream has Bragi got? We put it to the test. Again, Bragi's translation isn't local, which means you'll need to a) have the iTranslate app running to use it and b) have an iTranslate Pro subscription - $4.99 a month. Bragi is offering a free month's trial with purchase of the Dash Pro, but you can also get a free month just by signing up to iTranslate. Actually getting the Dash to talk to iTranslate is a bit more of a process than I expected. With the Pro paired to your phone you need to go into iTranslate and tap the Bluetooth button to find the Dash Pro - which then sends you back into the Bragi app to make a connection again to the Bragi. Without doing this, you can still hear translations, but you can't speak them back into the earbud. Once I'd done that I was set to go, but you need to do this every time you want to use the translator. To try out Bragi's new tool I roped in a friend who's fluent in conversational Spanish and Portuguese. I know this is mostly a test of the capabilities of iTranslate and not the Dash itself, but I wanted to see how fluid a conversation could be when using the earbuds. There are two ways the Bragi Dash Pro can translate. Either one person wears the earbuds while the other listens and speaks through the smartphone or you can do earbud-to-earbud, but this requires both people to have the Bragi Dash Pro - the chances of that happening in a cross-language encounter are slim. I could only try the former method for now, but I expect doing it bud-to-bud isn't too different, just a tad more convenient. When normally using the iTranslate audio function you're presented with two flag icons that indicate the languages you've chosen. To translate from the Bragi, however, you can just tap on the left earbud, wait until you hear the tone, and start speaking. It was pretty good at knowing when I'd finished a sentence - which again was denoted with a tone sound. It began with me wearing the Dash Pro and my friend using the phone. We measured an average of a two-second delay between speaking through one end and the audio playing on the other, on both Wi-Fi and LTE. I tried using the offline mode, which requires downloading language "packs" to the phone, but right now Bragi's translation only works when you're connected to the internet. It says that will change down the road. As an alternate to tapping the left earbud, the Dash also has a nodding gesture to start a translation. However, in practice this either made me feel a bit stupid or had a habit of starting when I was nodding along in agreement before my friend had finished her sentence, which interrupted the flow. Also worth adding that nodding isn't a universal gesture, so in some cultures this probably won't have the desired effect. After a while we got a running conversation, and while the translation itself wasn't perfect, we had a good flow. My friend was impressed by the accuracy but pointed out that as soon as either of us started to slur our words it keeled over. She also noticed how iTranslate had a habit of mistakenly copying the English syntax to Spanish/Portuguese, but on the whole it did a good job, especially when we were making extra effort to enunciate our words - which people tend to do when speaking across languages. Overall, Bragis' translation tool is good, when it works, but it's a bit of a process to set up and sometimes it just wouldn't make the connection. Frustrating. Also, I expect bud-to-bud translation is a smoother experience, but in most situations this means having a second pair on you ready to be whipped out at any moment, as per this ridiculous promo video. The advert paints a picture of seamless translation, and as I said, bud-to-bud is definitely going to be better, but not that effortlessly. Translation errors aside, there's still some latency, and you're going to need data roaming on while frolicking through unfamiliar streets, getting hit on by mysterious Bragi-wearing men, even though I'm sure she's wearing an engagement ring. Point is, it's neat, but it won't truly impress until it's done locally on the bud. By the end of this year we should be there.